History: (What If? II#93 (fb)) - After Wolverine's adamantium skeleton was ripped from him by Magneto, Wolverine began to lose his grip on humanity. He separated himself from the X-Men for fear of hurting them. (What If? II#93) - Ten years later, Wolverine had grown into a savage animal of the forest with almost no recognizable humanity left in him. The X-Men sent Cable out to hunt and capture the savage mutant. 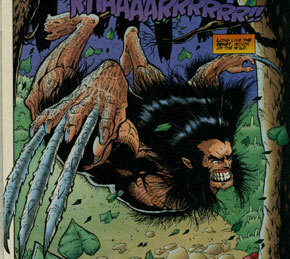 In order to bring him down, Cable set up a holographic trap that the animalistic Wolverine quickly sprung. Cable then electrified Wolverine in hopes of knocking him unconscious but unfortunately, the shock just angered Wolverine who savagely lashed out at anything in his path, damaging Cable's holographic projector. Once Cable managed to repair the projector, he activated it, revealing holograms of the X-Men Cyclops and Jean Grey that explained Cable's mission. With Wolverine distracted by the holograms, Cable once again attempted to capture Wolverine, eventually catching him with a net-projecting weapon. While inside the net, Wolverine managed to roll off the side of a cliff and escape Cable. He then turned the tide by sneak-attacking Cable as Cable tried to further repair the holographic projector. The two battled on the run until Wolverine tripped a trap that appeared to backfire on Cable by knocking him into a pit of sharpened tree limbs. Thinking Cable dead, the savage Wolverine found Cable's bag and opened it, revealing numerous photos of his old X-Men comrades. He then touched a strange metallic object in the bag which caused it to close around his hand, trapping him and activating the holographic projector. The feral Wolverine then watched images from his past and images of his old friends asking for him to return for help. Cable then revealed himself to be alive, having telekinetically deflected the trap. As Wolverine noticed the approaching Cable, the terrified former mutant cut off his own hand rather than face capture at his hands. He then made his way to a nearby cliff and howled at the moon, choosing to live the rest of his life as a animal. Comments: Created by Marc McLauren, Dietrich Smith, and Steve Moncuse. 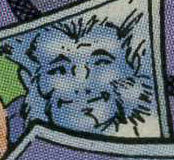 Beast was the basically the same as his Earth-616 counterpart. He was seen only in a photo so the changes to his life, if any, since Wolverine left the X-Men were unrevealed. He presumably had the same superhuman strength and agility that his 616 counterpart had. Cable was the same as his Earth-616 counterpart up until Wolverine left the X-Men. Ten years after Wolverine's departure, the X-Men had Cable hunt and capture Wolverine. The two battled for a long time until Cable managed to trap the feral Wolverine and show him holographic projections of those who were important in his old life. As Cable made his way to the captive Wolverine, Wolverine cut his own hand off rather than face capture. Cable then sadly mourned the loss of Wolverine's humanity as Wolverine fled off into the woods. Cable had telekinesis and presumably also had telepathy, just like his Earth-616 counterpart had. Cyclops was essentially the same as his Earth-616 counterpart. In the ten years that followed after Wolverine had left the X-Men, Cyclops remained with the X-Men and eventually had Cable track and capture Wolverine in hopes of helping the now-feral Wolverine rediscover his humanity. He presumably had the same optic energy blasts that his Earth-616 counterpart had. Gambit was the same as his Earth-616 counterpart. He was only seen in a hologram flashing back to Wolverine's past, so his future in the ten years that had passed since Wolverine's departure was unrevealed. He presumably had the same kinetic charging ability that his 616 counterpart had. 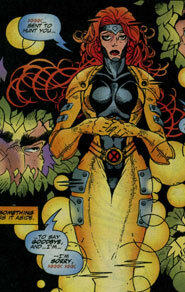 Jean Grey was the same as her 616 counterpart. In the ten years that had passed since Wolverine had left the X-Men, Jean had remained with her husband Cyclops and the X-Men. She eventually helped get Cable to capture Wolverine in hopes of helping the now-feral Wolverine rediscover his humanity. She presumably had the same telekinesis and telepathy that her 616 counterpart had. 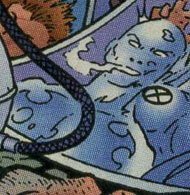 Iceman was the same as his Earth-616 counterpart. He was only seen in an old photograph, so his history following Wolverine's departure from the X-Men remained unrevealed. He had the same ice-manipulating powers that his 616 counterpart had. Jubilee was the same as her Earth-616 counterpart. In the ten years that had followed since Wolverine's departure from the X-Men, she had remained with the group and helped them get Cable to capture Wolverine in hopes of helping him rediscover his humanity. She presumably had the same low-level pyrokinetic abilities that her 616 counterpart had. 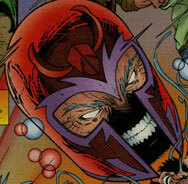 Magneto was the same as his Earth-616 counterpart, having magnetically pulled the adamantium from Wolverine's bones. Seen only in a holographic projection, his status following Wolverine's departure from the X-Men was unrevealed. Magneto had the same magnetic abilities that his 616 counterpart had. 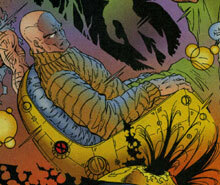 Professor X was the same as his Earth-616 counterpart. Seen only in a projection, his status following Wolverine's departure from the X-Men was unrevealed. He presumably had the same telepathy that his 616 counterpart had. 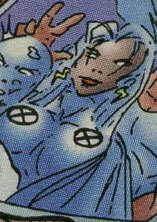 Storm was the same as her Earth-616 counterpart. Seen only in an old photo, her status following Wolverine's departure from the X-Men was uncertain. She presumably had the weather pattern manipulation powers that her 616 counterpart had. 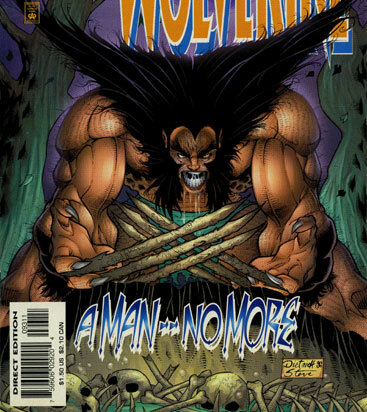 Logan was the same as his Earth-616 counterpart up until he left the X-Men after losing his adamantium skeleton. As he continued to lose his grip with humanity, he eventually de-evolved in a feral state, living like an animal in the woods. Ten years later, the X-Men sent Cable out to capture Wolverine and bring him back to them in hopes of helping him rediscover his lost humanity. After battling Cable and watching a few different holographic projections concerning his past and why the X-Men were hunting him, Wolverine cut off his own hand rather than face Cable. He then ran off into the woods, shunning any attempt at restoring his humanity. Wolverine had bone-like claws that retracted from his forehands. He also had a superhuman healing factor and senses. All other characters mentioned or pictured are &trade; and © 1941-2099 Marvel Characters, Inc. All Rights Reserved. If you like this stuff, you should check out the real thing!